We are all very familiar with this side of the Himalayas and some parts of the Trans Himalaya which falls inside our country like Ladakh and Lahaul-Spiti but there is a whole new world out there beyond these areas. As you are well aware most of these Great Himalaya lie besides our Country in Pakistan and China (also in Nepal and Bhutan but those are easily accessible). As fate would have due to International Geo-Politics we cannot really travel overland as we would love to into the vast expanse of the Trans-Himalayas which lies mainly in the Tibetan Plateau. Travelling to Pakistan to see the mountains is pretty much out of the question. So that leaves us with China where Indians can and do travel but mostly on business trips. For me on a personal basis the Trans-Himalaya and its its adjoining Ranges lie in three different parts of China for which the Ground rules and access differs. As per the political division of China these three are the Tibetan Autonomous Region, the Xinjiang Autonomous Region and Yunnan. 1. TIBETAN AUTONOMOUS REGION : This is what we also called as Tibet proper as defined by the Chinese Government. Of course there are parts of Tibet (historically/ geographically/ ethnically) which are not a part of TAR but are included in the neighboring Provinces but more on that later. A. Tibet Travel Permit : The Tibet Travel Permit is issued by Tibet Tourism Bureau (TTB). It is also called Tibet visa, for the purpose of entering Tibet. Travelers need to have Tibet Travel Permit to enter into Lhasa or any other parts of the Tibetan Autonomous Region. It is obtained through tour operators for most tourists. When you take a flight or train to Lhasa, you will be asked to show this permit during check-in. Even if you have the Tibet Travel Permit, you are not allowed to travel anywhere outside of Lhasa city. If you want to get out of Lhasa, you have to apply for another permit, Aliens’ Travel Permit. B. Alien’s Travel Permit : The Alien’s Travel Permit is issued by the Public Security Bureau. It is required when tourists are planning to travel to the ‘unopened’ areas of Tibet, like Mount Everest Base Camp in Shigatse, Samye Monastery in Tsedang. Aliens’ Travel Permit is required to visit ‘unopened’ areas. It is issued by the police (Public Security Bureau, “PSB”). Usually, you can apply for it once you arrive at Lhasa. For tour groups, our guide will ask you for the passport and Tibet Travel Permit, which they will submit to the Foreign Affairs Division of the PSB for the Aliens’ Permit. It normally takes several hours and the cost is 50 CNY per person. If you travel alone, you need to join local tours to ‘unopened’ areas, and the local travel agencies will arrange the PSB for you as well. Pay attention, no travel agency can provide ‘Alien’s Travel permit-only’ service. You need this for Mansrover as well. C. Militray Area Entry Permit : The military area entry permit is required if tourists are planning to travel to some military sensitive areas in Tibet. Like Mount Kailash in Ali, Rowok Lake in Chamdo.Sensitive borders such as Mt. Kailash and eastern Tibet not only require a Military Area Entry Permit, but also a Foreign Affairs Permit. For Tholing and Tsaparang in western Tibet, you will also need a permit from the local Cultural Antiquities Department. All these will be arranged by our travel agency one month before you enter Tibet. The Military Area Entry Permit is issued by the military affairs office while the Foreign Affairs Permit is issued by the Foreign affairs office in Lhasa. It normally takes 10-15 working days to get them all. So travelling in TAR requires a lot of preparation and permits and involves Tour agencies. Hence it is not a cheap affair.Of course there is a special agreement between India and China for the Pilgrimage to Lake Mansrover but that is just limited to the Lake.There are some agencies which do this through Nepal as well but again the scope is limited to the Lake Mansrover and the areas around it. 2. YUNNAN : Yunnan is the adjoining state to the TAR on the South Eastern side of TAR. 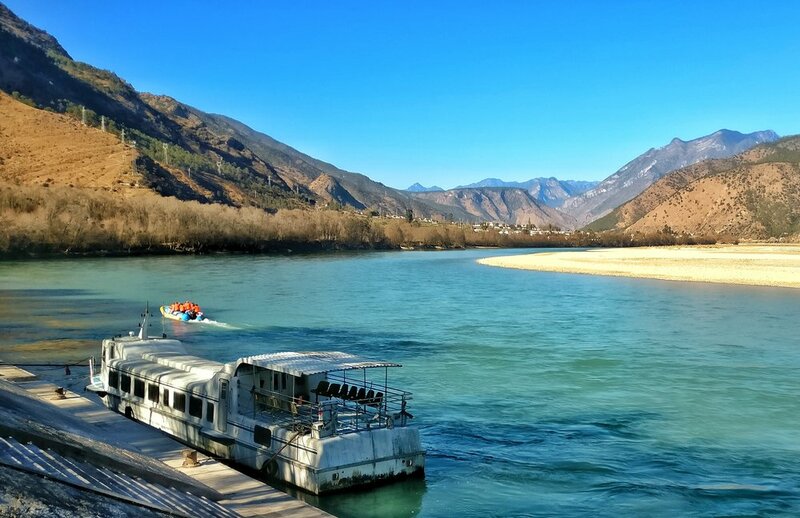 Western Yunnan is a very interesting area in the sense that it is where the the Himalaya, the Tibetan Plateau and the Yunnan Plateau meet. It is one of the world’s most biodiverse regions. Also many parts of Western Yunnan bordering TAR are actually parts of the historical Tibetan Region called Kham. However many of these areas are actually a part of the Tibetan Plateau with the average elevation above 3000 m. Note that other regions of China such as Qinghai and Sichuan also have substantial areas which used to be a part of Tibet. These areas are also free to travel to. There are no special permits required to visit Yunnan. Just get a Chinese Visa and you are good to go. Also there is now a direct flight between New Delhi and Kunming, which is the capital city of Yunnan. This is the same Kunming where the famous Stillwell or the Ledo Road ended connecting Assam to Yunnan in the good old days. Kunming itself at 1800 m plus is a beautiful place. Using Kunming as the base you can move further West using flights/ trains/ buses to go to places such as Lijiang, Dali and further to ShangriLa in Deqen or Zhongdian. TBH honest Western Yunnan with its high elevation but Southernly latitude is unlike any other place. The sharp jagged Peaks and the deep canyons and the rolling Mountains and Hills just take your breath away. The Tiger Leaping Gorge and the bends of the Yangtze are special attractions as well as the various Snow Mountains as they are called. 3. XINJIANG UYGHUR AUTONOMOUS REGION : This the region which borders Tibet on the West / North West. This Region used to be called East Turkestan and is a part of Central Asia with a majority of the population being Uyghurs, who are a Turkic people. Xinjiang is a land of extremes and includes parts of the Karakoram, the Pamirs and the Kun Lun mountains. Being on the main Silk Route this has for long been the fabled land that explorers wanted to get to. The names of exotic places like Kashgar, Yarkand and Hotan still fill your mind with visions of exotic lands surrounded by Mountains and Deserts. For me with a special interest in early exploration of the Western Himalayas these names are almost out of a dream. Now the good part. No special permit is required to travel to Xinjiang. You can take a direct flight to Urumqi which is the capital city. Please note that Xinijang is almost one third the size of India pretty much like the TAR. As an ideal base for someone like me I would choose the city of Kashgar 1500 km down to south.Kashgar is the end point of the Karakoram Highway coming from Pakistan. Again there are options of travelling to Kashgar by Air/ Train / Bus as per what suits you the best. Kashgar serves as a base to go to the Sarakul Lake and the monster called Mustagh Ata. You can further go down the Karakoram Highway till the town of Tashkurgan for which you will require a special permit. Once you have this permit you can even try your luck going till the Khunjerab Pass but usually they dont let foreigners proceed beyond a point a 2 or kms before the Kunjerab Pass. Note that as Indians travelling on Indian Passports we would be least liked people hanging around especially the authorities. So when you try doing this keep in mind that, though not illlegal, it can get you into a situation which might require you to answer some questions raised by certain Authoirities. Do this only if you are confident enough about yourself and your backup getting you out of any situation that might arise. Being confident would be the key. You could also travel from Kashgar to Yarkand and onto Hotan to see the Taklamakan Desert. Yarkand was where the trade route used to go to from Leh. So its a town that just cannot be missed IMO. There are also other interesting places around but for that you need to do some research. So go out. Travel. See unseen worlds. extensively in China mostly for work purposes. Most of this information is based on the best of my research and getting some information from Agents. Some of it is based on actual travels. Kindly verify the information from other sources as well. Pic from January 2017. In the shadow of the Shika Snow Mountain, Tibetan Plateau, ShangriLa, Deqen Tibetan Autonomous Prefecture, Western Yunnan.